The global emergence of multidrug resistance (MDR) tuberculosis (TB) cases has demanded an accurate, simple and rapid drug susceptibility testing (DST) method for drug resistance (DR) identification. Microtitre DST, a new culture-based assay, is designed to have many remarkable advantages compared to the other DST methods currently in use. This assay is a semi-automated system with a 96-well microtitre plate containing a range of concentrations of 14 drugs used for TB treatment, including first-second line and 2 new compounds. MIC (minimum inhibitory concentration) measurements are determined at day 14 post incubation. The Vizion Digital system is harnessed for automated reading, using a software, called the Automated Mycobacterial Growth Detection Algorithm (AMyDA). The assay was evaluated to be consistent and accurate through external quality assessment Mycobacterium tuberculosis (Mtb) strains in previous literatures. Here we applied microtitre DST and AMyDA software on Mtb clinical strains to investigate their correlations with Mgit DST and determine how they could be deployed in diagnostic workflow. The MICs of 194 Mtb clinical strains tested by microtitre DST were compared with categorical results (sensitivity or resistance) from Mgit. The results showed that the overall categorical agreement with Mgit was 95.8% (95%, 93% and 99.5% for ethambutol, isoniazid and rifampicin, respectively). We also assessed the using of the AMyDA software for MIC recording. Out of 2002 MIC values of 156 clinical isolates inferred by both manual and automatic readings at day 14, the overall proportion of consensus MICs was 87%. The discrepancy results are mainly due to the insufficient growth of Mtb at day 14, which made plates unreadable by the software. Our results further confirmed the accuracy and consistency of microtitre DST assay to be used as a new and helpful diagnostic tool. The AMyDa software could be used in combination with manual reading to infer the consensus MICs and to detect the significant difference in plate interpretation, particularly with plates being difficult to interpret. Together these new tools can be applied in TB diagnosis to determine MICs of all antiTB drugs and to optimise DR treatment. 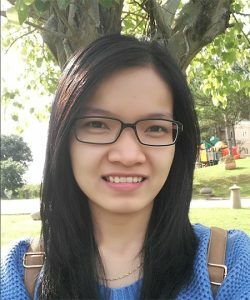 Ms Hoang Ngoc Nhung graduated from University of Science, Viet Nam National University Ho Chi Minh City in 2006. She also obtained the Master degree of Microbiology here in 2013. She has been working in Oxford University Clinical Research Unit since 2013 as a senior research assistant in Tuberculosis group. Her research interest is drug resistance of Mycobacterium Tuberculosis.